A rare and extremely handsome 1938 Lagonda LG6 leads the entry for Barons’ British Heritage, Classic & Sports Cars sale at Sundown Park on June 13th. This splendid machine, still bearing its original registration number FMA 52, has a memorable chassis number - 12345. It featured in Autocar magazine’s Use Car Test Report in December 1952 and spent 30 years in the United States from 1966-96. In recent years it has been the subject of much work and is a beautiful example of a magnificent British motor car. Estimate: £80,000-£95,000. 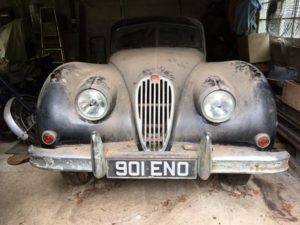 Keeping with the British Heritage theme, and guaranteed to catch the eye of enthusiasts looking for a project are three classic British cars. 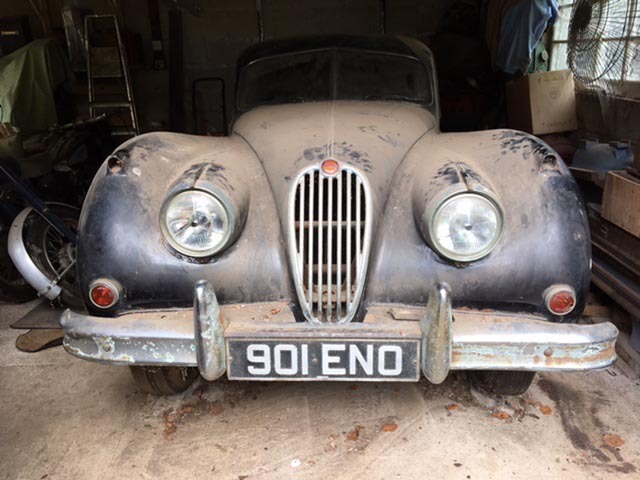 The 1954 Jaguar XK140 was bought as a restoration project in 1979 but made little progress and is now a barn find in need to total restoration. Complete with the distinctive registration number 901 ENO it is offered at no reserve. The 1971 Bristol 411 S2 is in need of a less extensive restoration as it was subject to a full interior refurbishment in 1989, after which it won the 1990 Bristol Owners Club Dudley Ryless Trophy. It has been garaged since 1999 (£17,000-£20,000). And the 1981 Morgan 4/4 has sat unused for about 20 years in a garage. The body panels are in remarkably good condition and the car is just waiting for an enthusiastic restorer to take it on (£7,000-£11,000). The oldest car in the sale is an absolutely charming 1924 Riley 11/40 Sports Tourer. Although now in her tenth decade, ‘Blue Belle’ was shipped as a chassis to Australia in 1925 and bodied there, initially as a four-seater with a touring body. During the War years it was transformed into a pickup before being stored for 40 years. More recently it has been fitted with a hand-crafted all-alloy body from Coachcraft of Melbourne, but still features the original engine, gearbox, Riley embossed rear axle and running gear, which have all been rebuilt. The estimated cost of the work done is in the region of £80,000-£100,000, but the car is on offer at Barons for £28,000-£33,000. The non-British contingent in the sale includes a superb 1989 Porsche 964 Turbo Group One racing car, a GT Cup competitor that finished 3rd at Spa and 2nd overall in 2009. Presented in its 2009 race livery, this 911 weighs less than 1000kg and boasts a race-tuned 560bhp engine that propels it from 0-60mph in under three seconds (£55,000-£65,000). Another fine piece of German engineering comes in the form of the 1957 Mercedes 190 Ponton, which is being sold with registration number WUV 67. An original British-delivered, RHD car, it has had very little use and is in excellent order (£6,000-£8,000). The 1981 Isuzu 117 Coupe is one of the last of the line and is extremely rare in the UK. It spent much of its life in Japan and has an estimate of ££5,500-£7,000. Following a strong start to 2017 with its first two sales of the year, Barons has attracted an excellent range of classics and sports cars to appeal to a wide range of enthusiasts from its international audience of buyers.